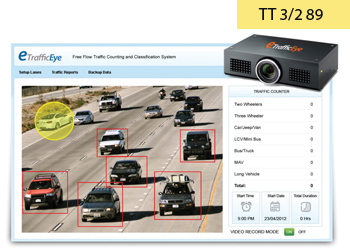 eTrafficEye from TechSture Technologies uses complex algorithms to he lp enforce traffic management and traffic safety standards on highways and city roads. At traffic intersections it monitors traffic congestion in all the directions and switches the traffic signals accordingly. At the same time it captures high resolution images of red light violators. It monitors vehicle speed, detects vehicles going beyond speed limits and sends information about over-speeding vehicles to the traffic control room. It can also detect vehicles going in the wrong direction and accidents and send alerts to the control room.